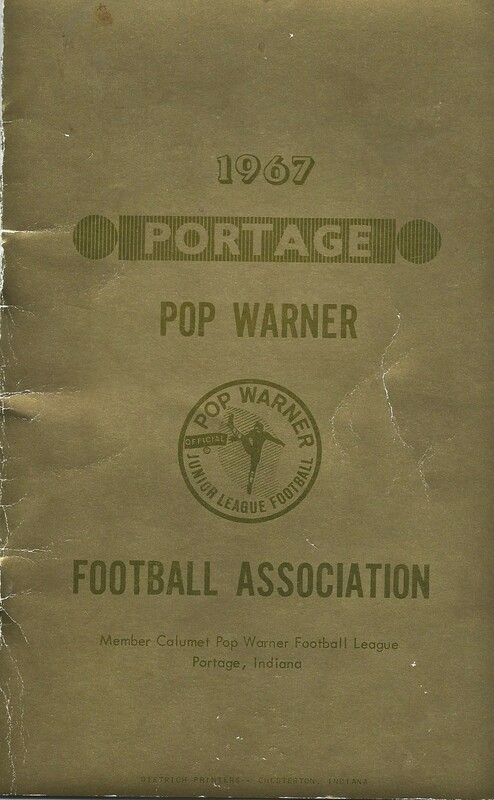 Portage Pop Warner began playing football in the fall of 1967. This writing is the memories of someone who was on that first team and whose father was one of the founders of the team and was one of the original Board of Directors. 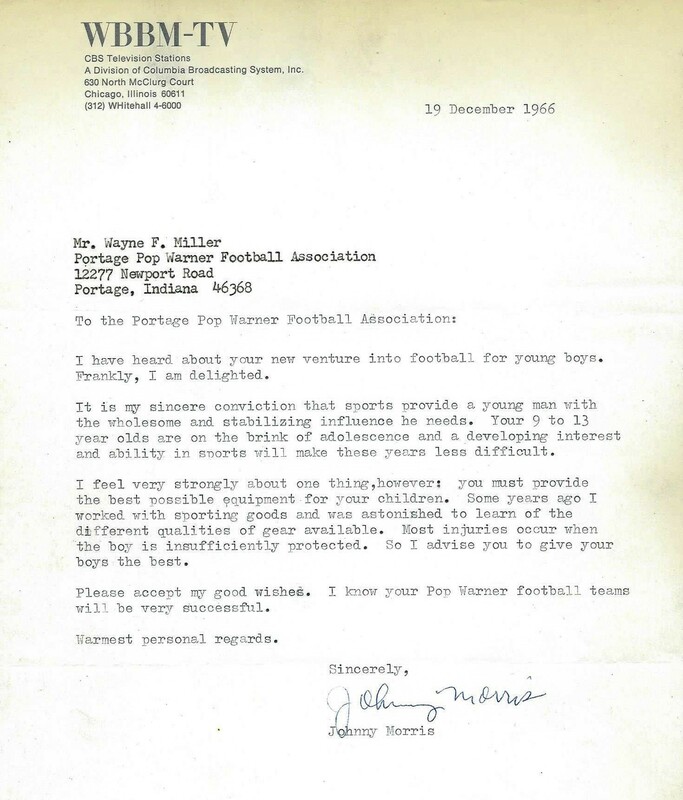 The idea of fielding a youth football team had been discussed by adults throughout the mid-1960s. These discussions were informal between adults who had sons playing Little League Baseball or Biddy Basketball or adults involved in those leagues. 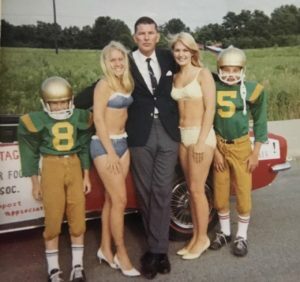 Sometime in the fall of 1966 a group of men and women decided to try and field a team the following season (fall of 1967). 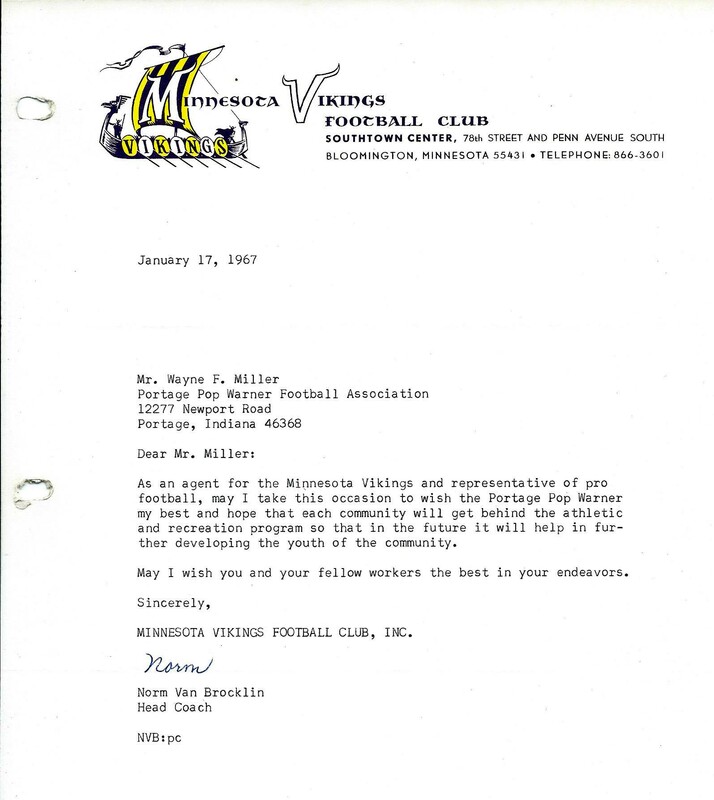 The initial "formal" meeting to form a team was held in October 1966. The following Vidette-Messenger article from 10/18/1966 is to the right and lists those adults at the first meeting. I am not sure what adult was the first two phone numbers, but ours (Miller family) was 762-7488. The Vidette-Messenger on 11/1/1966 provides a list of adults attending the second meeting and discusses a planned third meeting. The article below, provides names of those attending this second meeting. The meeting was held in the old Portage fire station near the intersection of Central Avenue and Swanson, which would later house the Portage Jaycees and host Halloween events. The building was torn down in July 2017. 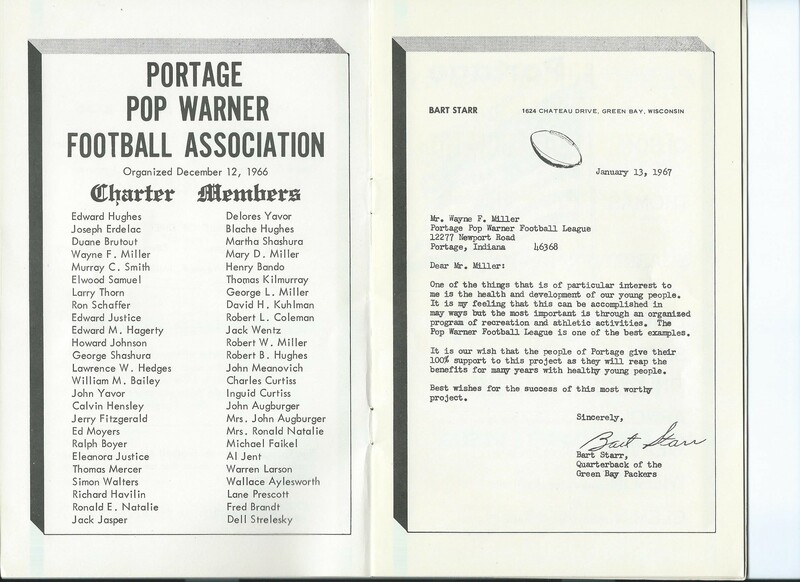 Sometime after that third meeting a decision was made to create a Portage Pop Warner organization. 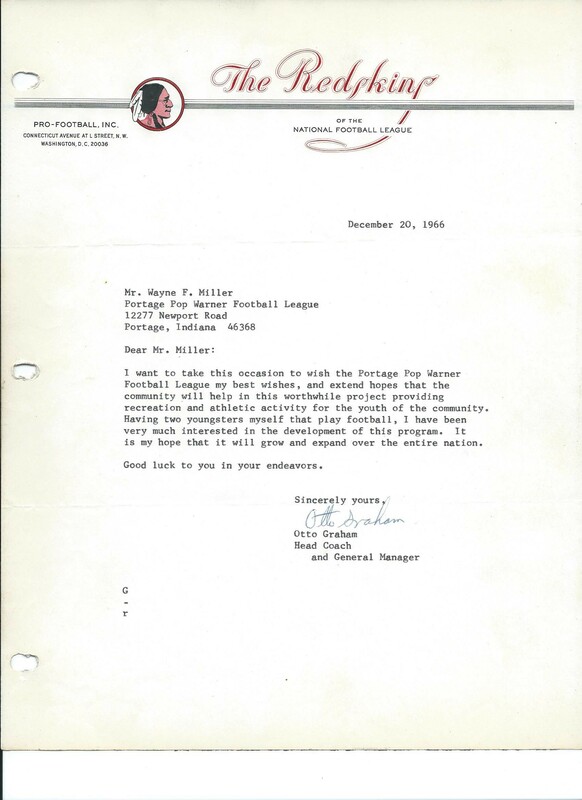 The following is from the initial season program and provides the names of those individuals who signed the initial charter on December 12, 1966. I am not sure when the initial officers were elected/selected, but by April 17, 1967, Ed Justice was the President as shown in this Vidette-Messenger clipping. The initial officers and Board of Directors are shown from the initial season program. Registration was on May 20 and 27th (cost was $5). Physicals were on August 10th (cost was $1) and the first practice was on August 14th. The Football-Rama was on September 3, 1967, so there were only a handful of practices between the 1st practice and the first scrimmage. Not a lot of time to get ready. Evergreen Park is where the town's first tennis courts were constructed. The site of the park now hosts a building. Picture is from 1968. 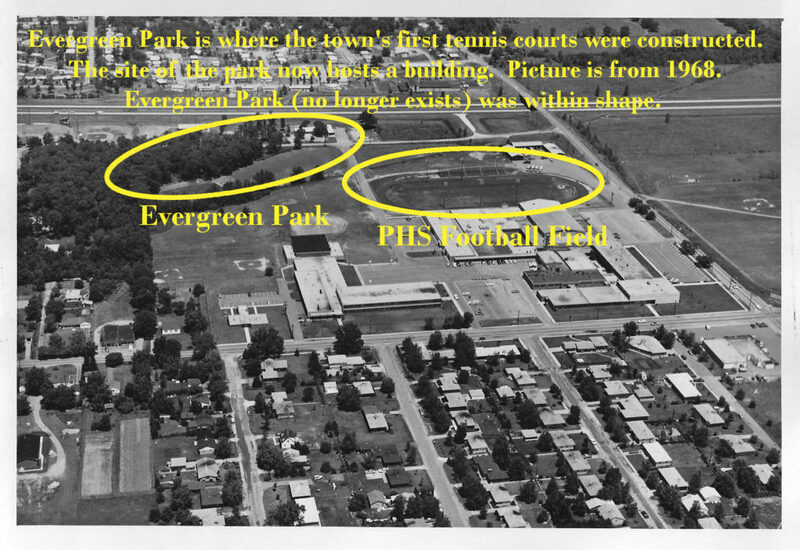 Evergreen Park (no longer exists) was within shape. The uniforms that first year were green jerseys with gold numbers, gold pants and gold helmets. The first game was played on September 10, 1967. Portage fielded one team comprised of players aged 10-13. The other teams fielded teams in the 9-11 age group and a team of players up to the age of 13. The six team league was comprised of four teams from Indiana and two from Illinois. Games were played on the (then) high school football field off Willowcreek. My recollection is that the team was winless. 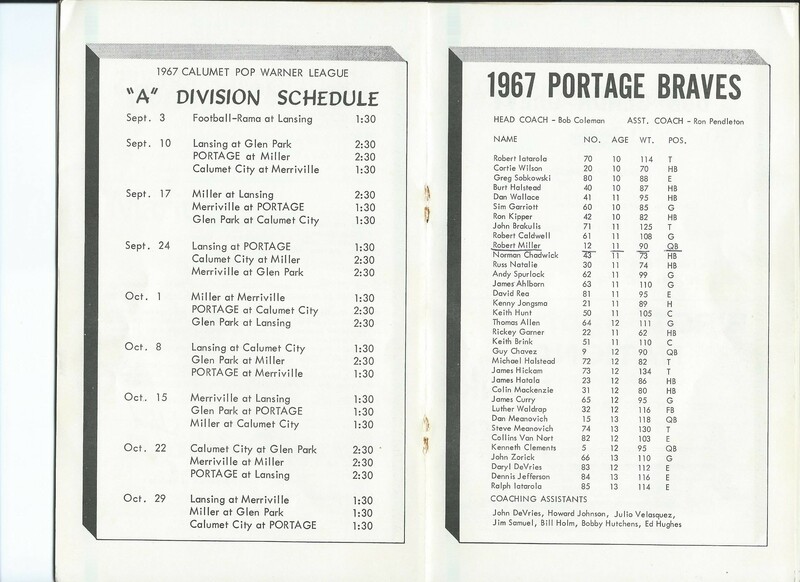 Despite those humble beginnings, within three years Portage would field an undefeated team that would win the league. 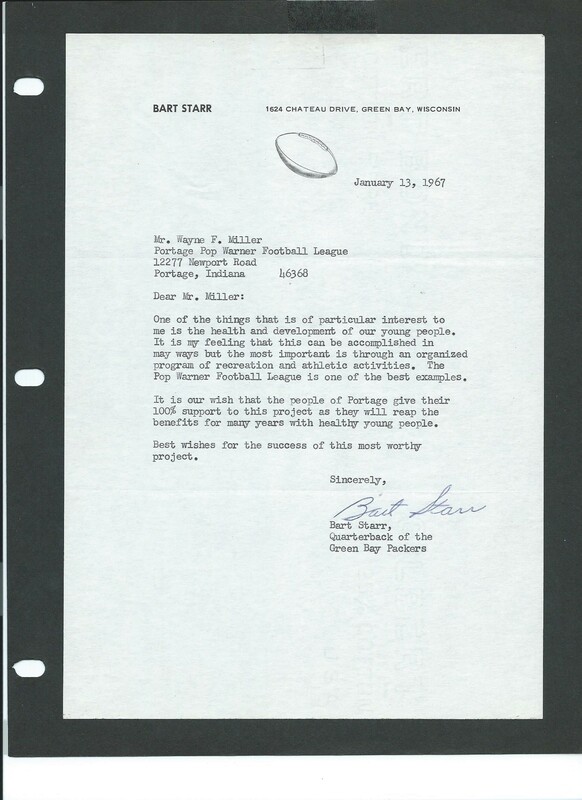 The first game was at Miller (Wirt High School) on September 10, 1967. 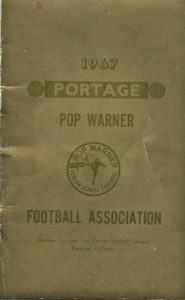 On September 17, 1967 the team played their first home game at the Portage High School football field against Merrillville. 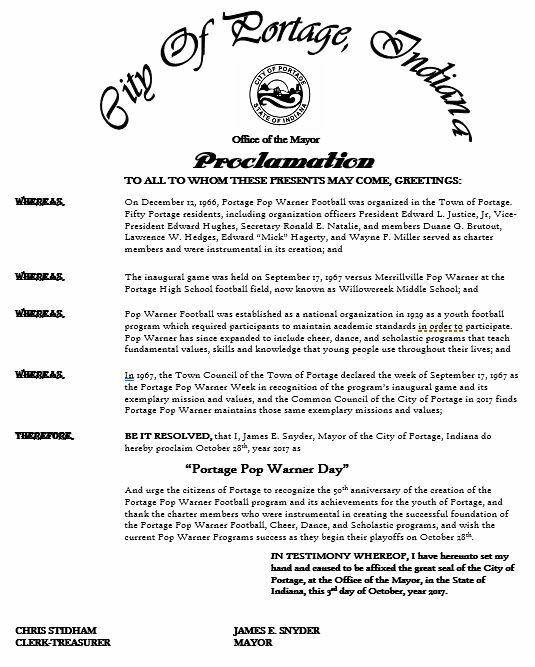 That week, Portage Township Board William E. Westergreen declared the week of Septemeber 17, 1967, Portage Pop Warner week in honor of the fledgling organization. 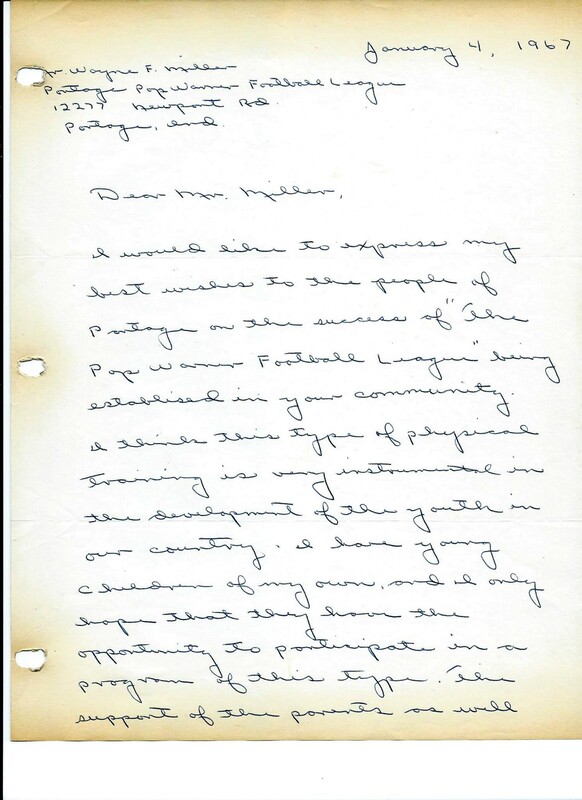 One of the reasons, in addition to providing youth sports opportunities, was to help improve the football teams at Portage High School. 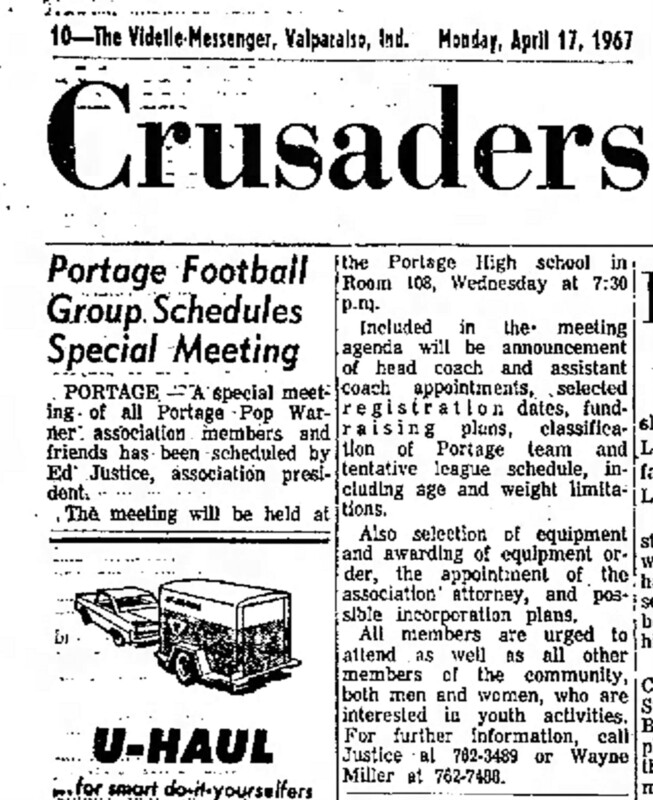 Prior to Pop Warner, the initial organized football in Portage was in the 7th grade. Of the 35 players on that first team, nine ended up playing varsity football at Portage (one at Andrean). Another five had very successful high school careers in other varsity sports. First year player Robert "Bob" Iatarola (Andrean '75) became the first Portage Pop Warner player to play D1 football when he lettered at Indiana University in 1976. He played in the North-South football game in 1976 (1st for PPW) and was third the state in the shot put in 1976. Cortie Wilson (PHS '75) would not only be the QB on Portage High School's state semi-final football team in 1974, but would go on to start at quarterback at Valparaiso University in the late 1970s. Ken Clements (PHS '73) would play on two PHS sectional basketball teams and be a stalwart on varsity baseball teams that would win two Duneland Conference championships and one sectional when he was 14-1 as a starting pitcher. Dave Rea (PHS '73) woul be the MVP on the Potage swimming team. Greg Sobkowski (PHS '75) would also play with Wilson on that PHS football team and would later become the Portage City Attorney. First year players who played PHS varsity football: J. Hatala ('73, also varsity wrestling), D. Meanovich ('73, track), S. Meanovich ('73, baseball), J. Ahlborn ('74, track), J. Brakulis ('74, baseball), B. Miller ('74, basketball), D. Wallace ('74, golf), G. Sobkowski ('75) and C. Wilson ('75, baseball and basketball). First year players who played other varsity sports at PHS: K. Clements ('73 baseball and basketball), K. Jongsma ('73, baseball and tennis), C. Mackenzie ('73, wrestling and tennis), D. Rea ('73, swimming) and R. Natalie ('74, baseball). 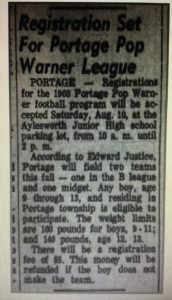 Despite the record on the field, Portage Pop Warner was here to stay. In September, during the season, the organization announced that they would be bringing in the Fabulous Magicians to the high school gymnasium as a fund raiser. 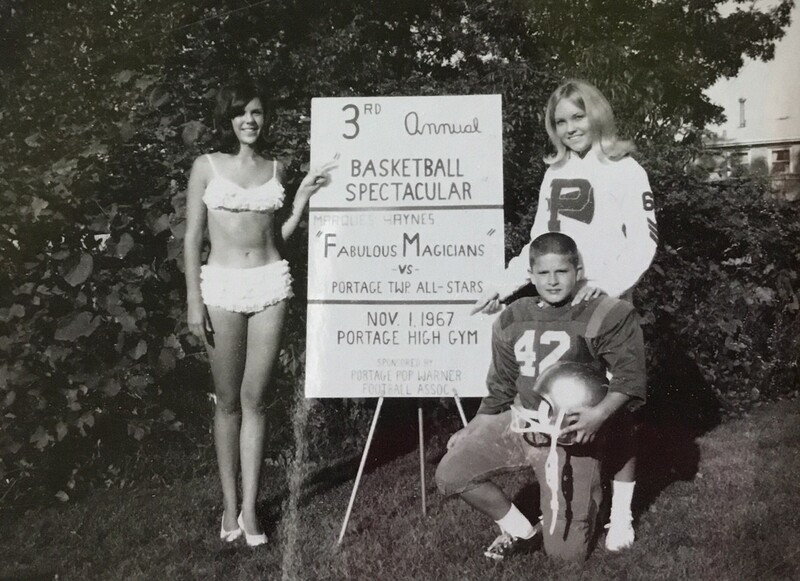 In fact, they had decided to bring the magicians to Portage prior to this time as shown by a car Portage Pop Warner had in the town's July 4th, 1966 parade. 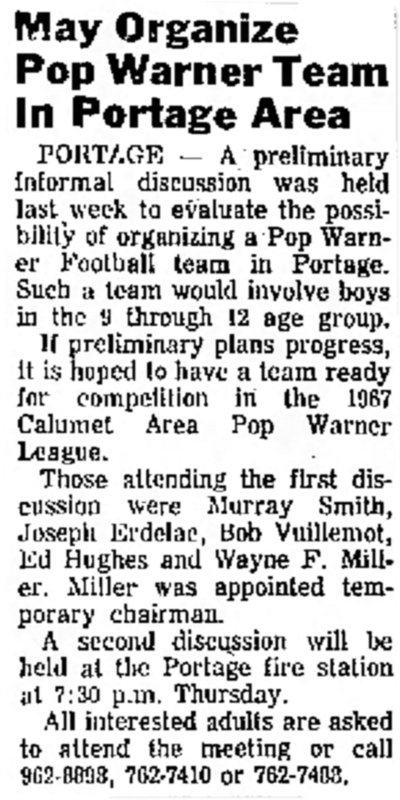 In December 1967 Portage Pop Warner held a meeting to elect new officers and plan for the s econd season. Ed Justice, Ed Hughes, Ron Natalie, Duane Brutout, Mick Hagerty, Larry Hedges, Wayne F. Miller, Bob Coleman, Ron Pendleton, John Devries, Howard Johnson, Julio Velazquez, Jim Samuel, Bill Holm, and Bobby Hutchens: all of whom jointly should be considered the "Fathers of Portage Pop Warner." 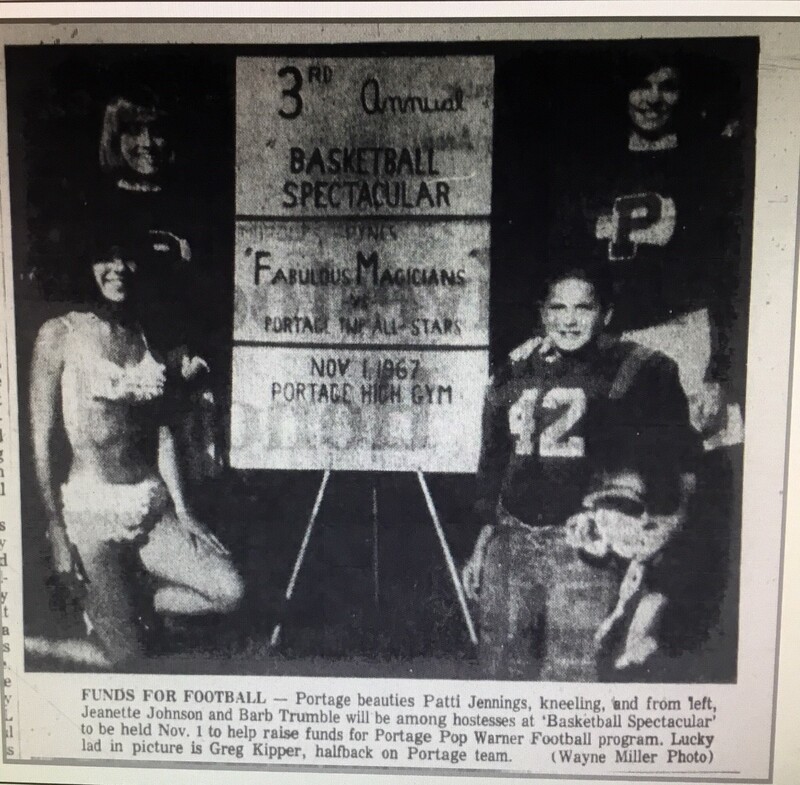 Two individuals who helped form the organization but did not serve on the first Board, etc but who were vital to the start up were Joe Erdelac (long-time Portage Fire Chief) and Elwood "Bud" Samuel (long-time President of Portage Biddy Basketball). The spouses of these men also were extremely supportive and enabled to the program to get up and running. 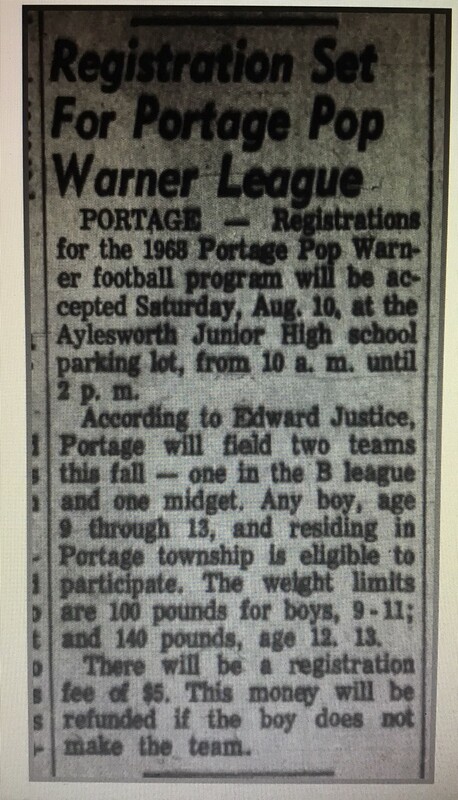 Portage was the first town/city to have Pop Warner football. 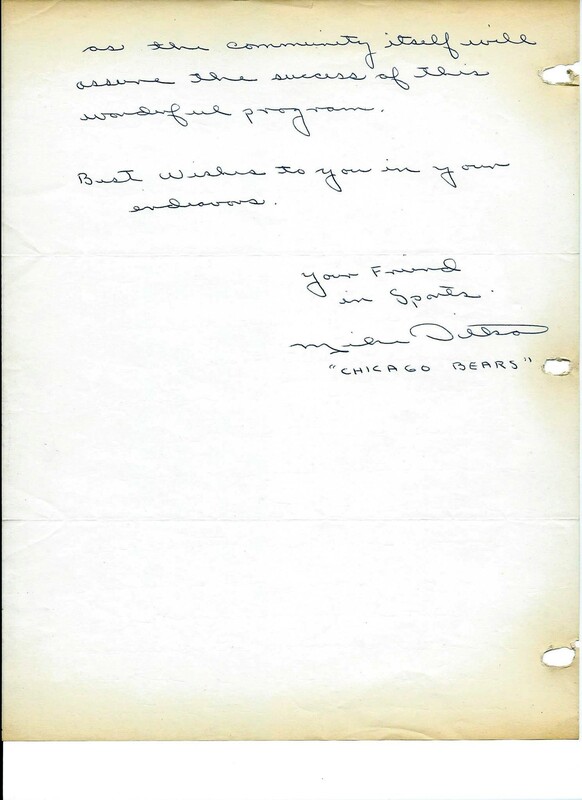 Valparaiso started their teams up in 1969 and Chesterton soon thereafter. Dave Rea: I recall how excited I was to get the new uniforms. We weren't very good that year. Rick Garner: I can remember how excite I was to put on those pads and uniform. I felt invincible. I soon learned I wasn't when I got the wind knocked out of me, the first time that happened. I remeber my Mom was worried I'd get hurt playing, but she didn't have any worries about me riding my bike two miles down central Avenue to get to practice. Bob Miller: We practiced in a field off Evergreen Avenue that was called Evergreen Park. The Dusty Rhode Boys and Girls Club is built on that site today (built in 1996). Back then it had tennis courts (first in the town and where the high school played back then) and the highs chool also used that field for PE classes during the school year. I just recall how hot, muggy and mosquito infested it was practicing by the drainage ditch that existed back then. 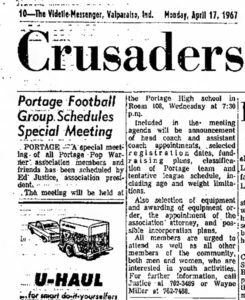 Before my Dad (Wayne F. Miller) passed in 2001, we would on occasion discuss Portage Pop Warner and how far it had come in terms of teams, adding cheer, etc. He was proud of his involvement in helping get it started and always spoke highly of the others like Ed Justice. But he was also happy of the adults in the following years who had taken it to the next level. Howard Johnson (asst coach): They brought in the Fabulous Magicians with Marques Haynes as a fund raising event at the high school. As an assistant coach I was able to be on the team that played them. A thrill for sure. Fund raising was always a problem. 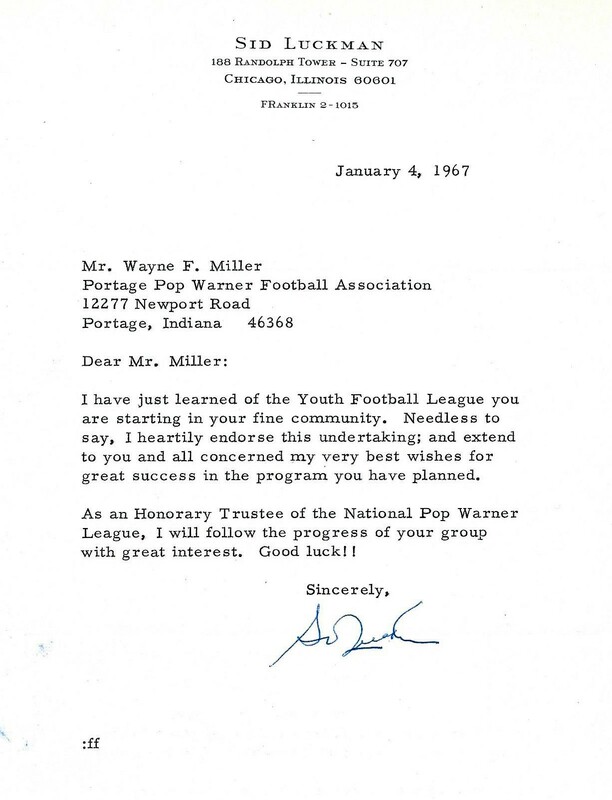 As Publicity Chairman, Wayne F. Miller was proactive in getting the word out about Portage Pop Warner. In addition to bringing the Magicians to Portage for a fund raiser he wrote numerous articles for the local papers. 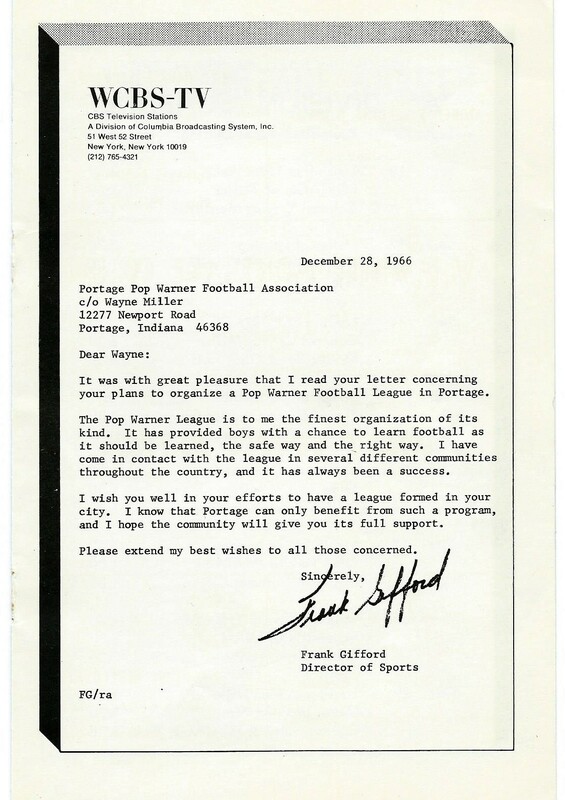 He also wrote a number of sports dignitaries letters asking them to endorse Portage Pop Warner. 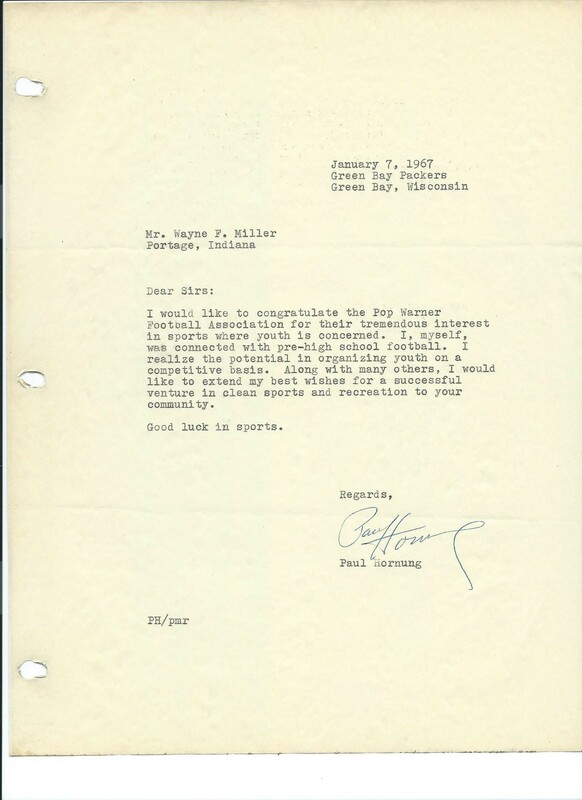 Though the Miller family does not have any of the outgoing letters, they do have many of the letters these sports figures wrote back. 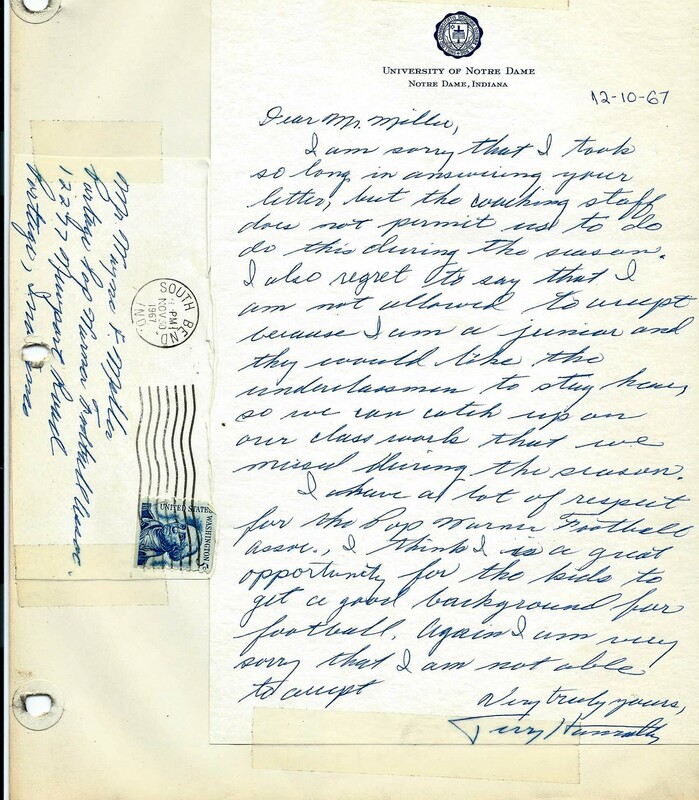 Many of the letters were in the first program. In addition to the schedule and roster the program had advertisements for local vendors as a means to generate revenue. 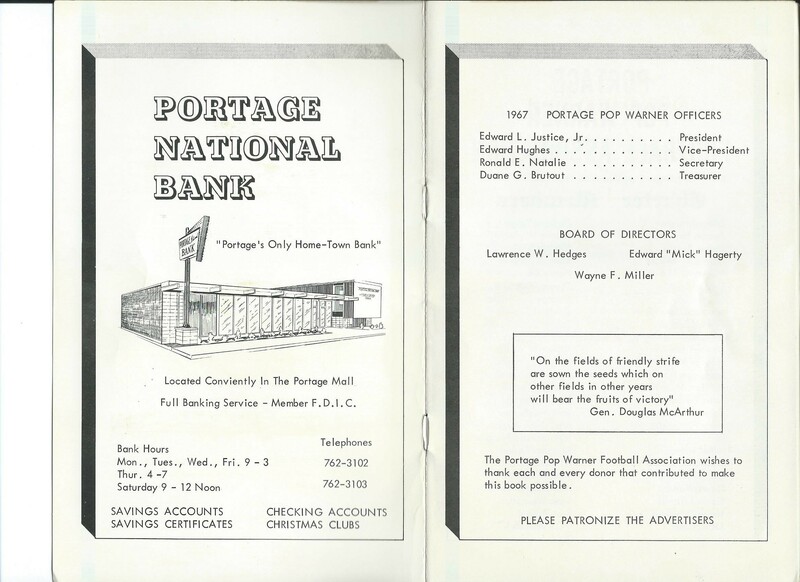 In November 1967 the first election for the City of Portage was held (elected officials would take office January 1, 1968). The program included advertisements for candidates seeking office in that first election. First preliminary meeting held to discuss possibility of forming a team/organization. Attendees: Joe Erdelac, Ed Hughes, Wayne F. Miller, Murray C. Smith and Bob Vuillemot. Miller is chosen as temporary chairman. Portage Pop Warner has a convertible in the parade.